The holidays are indisputably the busiest season for airlines. Not even summer jaunts across the country or between continents can stack up against the millions of folks who take to the air during late November and December. According to national travel company AAA, some 103 million Americans were expected to fly for just Christmas and New Year’s celebrations last winter. That’s why travel expert Andrew M. Berke is here to shed some light on ways to make your time at the terminal less of a headache. Given his experience in the industry, these sage words of advice are bound to provide for a bit more holiday cheer and less headaches and hiccups. – Timing is Everything: Citing research done by Forbes magazine, Andrew M. Berke says that you should acquire tickets for a Christmas flight in October. If we extend that two-plus month cushion to those who’ll be flying for Thanksgiving, start giving it serious consideration in early September, he says. In fact, Forbes states that the price for plane tickets can jump as much as $7 per day during the two weeks before Christmas. Business Insider, an international news website, notes in a November 2017 article that an early flight out for Thanksgiving is one of the best ways to avoid delays. However, it’s understood that taking the entire week off for the sake of a stress-free flight isn’t possible for everyone. In that case, Business Insider states last-minute travelers who depart on the actual holiday will see the least amount of delays. – Terminal Reality: Those who’ve flown at least once can likely understand why and how an airport terminal could become a place of massive stress. 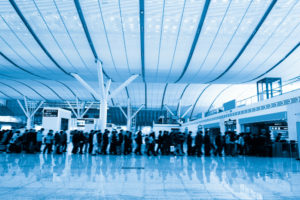 In order to steer clear of this during the holiday season, Andrew M. Berke says that recent changes to the Transportation Security Administration (TSA) inspection process probably could have been rolled out at a different time. Still, The Sacramento Bee notes that 93 passengers missed their flights on one day at the Sacramento International Airport due to the length of time it took to go through the check-in process. Andrew M. Berke can’t stress this enough: Get to the airport two hours early. You’ll be thankful for the excess downtime later if everything else goes according to plan. – Precipitation Complication: If you’re departing from airports along East Coast or in the Midwest, extreme cold, snow and other forms of inclement weather can dash plans. According to Frommer’s Travel Guides, leaving on some of the first flights of the day is a good way to beat delays that mount as the day goes on. This is because those planes will be prepped and ready to roll while later flights will be at the mercy of ground crews working hard to keep everything else on schedule. This entry was posted in Uncategorized and tagged airport, andrew m berke, travel, travel guide, vacation by ms_admin. Bookmark the permalink.